There are tons of steelhead in the river! We are excited to resume guided fishing trips on the Muskegon River on Monday, (4/21). Water levels are steadily dropping and clarity is good! Great News!! After nearly a week has passed, water levels are now stabilized and slowly dropping nicely. Boat launches are not yet open but we are optimistic that launches should be open and fishable by Monday,(4/21) We should be able to resume normal scheduled trips and guiding in a normal fashion. Water temperatures are great, and water clarity is much improved. Mostly clear with a slight green tint, definitely not muddy, which is great!! We are excited to start guiding again Monday!! As of this morning, Water levels are still extremely high but, seemed to have leveled off to a maintainable level. Some homes and foundations are flooded and many people along the river have water around their homes and flooded basements. At least in the area of Devil’s Hole, (Below Thornapple access) water is only in the yard, not in the yet inside the homes. Bridgeton and Maple Island area is heavily flooded. For those of you following the USGS website, it appears that the river has crested and stabilized. Water levels are at 14.3 cfs, normal is about 2000 cfs. ( 6 times it’s normal water level.) I don’t believe the Muskegon River will be fishable until Easter Sunday. We are running scheduled guide trips on the Big Manistee and other local rivers. Fishing should be exceptional when the water levels come back down. Cold nights and cold water temperatures should keep most of the steelhead from spawning. May should offer great fishing as well! Muskegon River Flood waters. 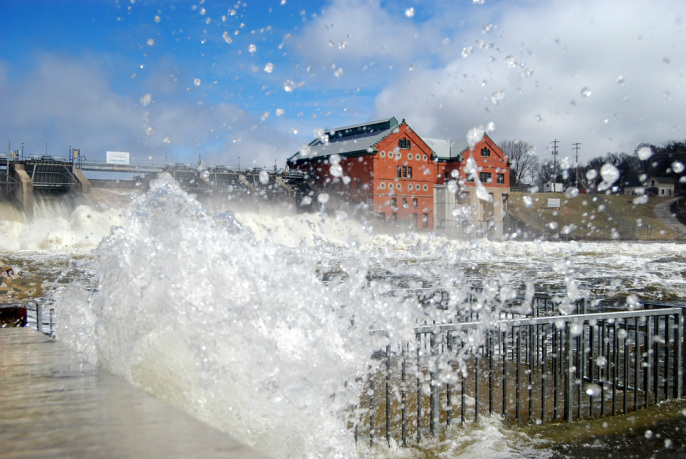 Water crashes over the handicap fishing deck on the Muskegon River below the Croton Dam near Newaygo, Michigan. River Levels are expected to rise above flood stage in the next several days. Water levels are high on the Muskegon River covering the board walk along the river and the handicap fishing structures. Boat launches have been closed and barricaded by authorities. Hostile law enforcement has threated to ticket onlookers and anglers going near the water. View from the Croton Dam bridge over looking the high water levels of the Muskegon River. Levels are expected to rise above flood stage and should crest (Highest point) sometime on Wednesday. Once water levels stabilize, steelhead fishing should be phenomenal! High Water Steelhead on the Mighty Muskegon River. Steelhead fishing was fantastic yesterday before the flood waters came. Fishing should be exceptional when the levels stabilize and become clear again later this week. Finally Spring has sprung and the steelhead are here in a big way! After a horrible and cold winter, the ice is finally off the Croton reservoir! This creates a wonderful spike in water temperatures that drives steelhead into the river and gets them fired up to spawn. There was a substantial spike in the water temperatures today from 35 degrees at 8am this morning, to an astounding 38 degrees at 6pm this evening. That gets steelhead on the Move, triggering fish to move into gravel shoals and begin to dig redds. Phenomenal fishing ahead! Using floats and spawn on Light spinning tackle has been putting the majority of fish into net as of lately. Fly fishing should turn on in a big way once water temps approach 42 degrees, that magic temp where hens begin to dig gravel and spawn. Over the next few days, a many steelhead should move up river in search of gravel. This is the fly fishing that most of us spend the entire year waiting for, spawning steelhead on gravel, a fly fisherman’s dream come true! With the photo period driving fish to begin spawning, and the much longer days of sunlight, we are offering guided half day afternoon specials. Boat traffic is minimal during this time day, and is nothing like the morning guide rush at the boat launch in the mornings. A relaxing, fish catcing afternoon is just what the doctor ordered! Afternoon trips are very productive because water temps are at their warmest for the day. Boat traffic is minimal allowing for steelhead to take time and feed. Guided Half Day Afternoon Trips are doing as well or better than full day trips for number of fish landed. . 3:30pm – 8pm for $250. Get out of work early and come fish the Might Muskegon River, Located less than 45 minutes North of Grand Rapids. Mark with his first of many Muskegon River Steelhead. Once steelhead is in your blood, you’re hooked for life! Mark is no exception. He absolutely loves the chrome bullet. Guided Half Day Afternoon Trips are doing as well or better than full day trips. Get out of work early and come fish! 3:30pm – 8pm for $250. Chad landed a huge plump hen! As you can see, these fish are becoming close to spawning. We have been landing several hens per day now that are loose and spawning, or very close. It should only be a few days before a good number of fish are digging gravel and spawning. Water levels are prime and in perfect condition. Levels remain high but offer some outstanding fishing if you know how to play your cards when the river is up. Starting to also see a fair number of blazing silver fish, especially chrome hens in the upper sections. Fishing should really start rocking at the end of this week with winter fish starting to dig gravel and spawn, and mint chrome fish coming up river to prepare to spawn. With the way things are headed, should be an incredible spring with lots of large steelhead and trout. These fish are from the same year class as our huge November fish from last fall. We should see some giants when they step up to the plate and start spawning. Water levels have been up for the past several days, although today was the first day that it was drastically better for us! We were finally able to piece the puzzle of high water together and catch some fish! Larger spawn sack in chartreuse netting played a huge key in landing fish, an offering that could be seen! I had a great two days with Steve, John, and Rick. Despite the nasty weather and tough conditions, We had a great time with plenty of laughs and managed to land some very respectable Steelhead and fat trout.